ARS Technica reports about a new startup called My Robot Nation. 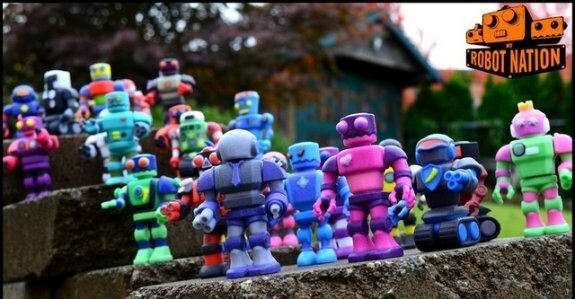 This firm enables you to create custom robot figurines via the web, which can then be printed in 3D for $17.99 to $169.99, depending on the desired size. The company is offering custom robot figurines built to specification. The My Robot Nation website has a slick interactive tool that allows users to configure the design of their very own robot. For a price, the company will use its 3D printers to generate a matching model which will be shipped to the desired address. Unlike existing 3D printing services that cater to more advanced audiences, My Robot Nation doesn’t require users to have CAD skills or be proficient in 3D modeling. Their Web-based robot construction tool gives users an assortment of existing interchangeable robot bits that can be selected to compose the desired design. The user can also choose colors for various parts of the body and apply stamps that decorate the robot’s surface.